The scientists of SRP Environmental are experienced in the design and implementation of various technologies utilized in the remediation of affected soil and groundwater. 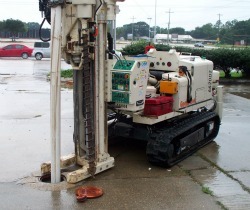 From single and dual phase extraction to chemical injection and excavation; the staff of SRP Environmental has successfully completed numerous projects in Louisiana and Texas. The selection of the appropriate technology is crucial to controlling the costs associated with remedial activities. Selecting the wrong technology could easily result in a lengthened remediation time frame, thereby resulting in additional expenses. Our clients can rest assured because we will guarantee the effectiveness of the remedial technologies that we recommend. The staff of SRP Environmental has extensive experience in the remediation of impacted media resulting from leaking underground storage tanks (and associated components) or surface spills involving contaminants ranging from fuels to lubricants. The proper installation and operation of these technologies is imperative to effectively reduce the contaminant concentrations below established regulatory limits. From the remedial design to the implementation of the remedial method, our clients can count on us to keep their out of pocket expense to a minimum. Give us a call to discuss the corrective action alternatives available at your site and how we can be of assistance.